In 1986, The International Association of Fire Chiefs (IAFC) and the International City/County Management Association (ICMA) met to discuss how to provide a more comprehensive evaluation process for the fire service. At the time, the fire service was experiencing a significant shift in services including emergency medical services (EMS), hazardous materials, and specialized rescue, and it was becoming evident that the current methodology to evaluate performance and effectiveness was not sufficient. A basic construct that both organizations agreed on was the need to design a process that would not only evaluate performance but would be a model to help the local city manager and fire chief to lead their fire service organization into the future, establish a methodology for continual evaluation, and provide the agency with recognition for their effort. The seed was planted that led a working group of more than 250 individuals representing government, academia, and the private sector to work 10 years on the development of what was to become the Accreditation Model. After a decade of hard work and cooperation, in December 1996, the IAFC and ICMA executed the Master Trust Agreement, establishing the Commission on Fire Accreditation International (CFAI) to promote the use of agency self-assessment toward an agency achieving accreditation and to pursue scientific research and education in the fire and emergency services. As the accreditation and research programs continued to expand, the original trust was dissolved, and the CFAI was incorporated as a nonprofit organization, governed by a Board of Directors that provided oversight to the CFAI Commission. As the accreditation process continued to grow, the concept of professional credentialing emerged with the Chief Fire Office Designation. During the next several years, other credentials were instituted, and the Commission on Professional Credentialing (CPC) was formed. To reflect the expanded focus, the corporation’s name was changed from the CFAI to the Center for Public Safety Excellence (CPSE) in March 2006, with the Board providing oversight to the two Commissions. As research was a part of the initial design of the process, a subsidiary CFAI-Risk was formed to pursue grant funding with the sole purpose of promoting research and the knowledge base of the fire and emergency services. To date, CFAI-Risk has been awarded funding to facilitate research projects including the NIST Report on Residential Fireground Field Experiments (Tech Note 1661), the NIST Report on High-Rise Fireground Field Experiments (Tech Note 1797), Fire Fighter Safety and Deployment Study Report on EMS Field Experiments, and FireCARES (Community Assessment Response Evaluation System). From its inception, the CPSE has focused on bringing together diverse groups and interests to guide and govern its operations and has benefited from the support and insight of representatives from the IAFC, the ICMA, the International Association of Fire Fighters (IAFF), the National Fire Protection Association (NFPA), the Insurance Services Office (ISO), and the Department of Defense (DoD). These organizations provide their support knowing that governmental fire and emergency services and state and local governments must define how communities should evaluate their risks and allocate their resources based on the missions and objectives of their emergency service organizations. As the CPSE organization has grown and developed, the mission and values have remained a constant for the CPSE and guide the way in which business is conducted. The Values: The Center for Public Safety Excellence pledges our commitment to how we do business. It is a declaration that compels us to listen more; to consider our actions and their impact broadly; and to lead responsibly, transparently, and with integrity. Progressive Leadership: We will use contemporary, thoughtful, and effective quality products and services that are beneficial to our communities. Outcomes: We will create mission-focused direction, define roles and accountability, and build strong relationships with our customers and partners to positively impact our stakeholders and the communities they serve. Continuous Improvement: We will continually monitor our operations and industry trends to ensure programs remain contemporary and to identify opportunities for improvement in the customer service experience. This is my 26th year serving in the role of fire chief, and I have experienced a significant shift in the demands of the position over that time. In today’s environment, one that demands transparency, where the trust in government is at an all-time low and the political landscape is often unpredictable, the need for the fire chief to have valid, qualified and quantifiable information regarding the department and its performance is crucial. As the demand for our services continues evolving to include an expanded scope of practice in EMS, a focus on Community Risk Reduction, the critical role that fire and emergency services have in Homeland Security, the importance of concentrating on outcomes and behaviors for the future of the fire service are important elements to our success and often future sustainability. Having led two organizations through accreditation, I can attest that is has been extremely valuable in the success of both organizations. What we have learned in the past 21 years since the concept of self-assessment and accreditation were launched is the impact this process has on organizational sustainability and customer/community engagement. Those organizations that have institutionalized the behaviors in their organizations have developed a culture that is customer-focused, strategic and focused on quality improvement. The results speak for themselves. These organizations weathered the recent economic depression much better than their counterparts did. Today, we are seeing a direct relationship in accredited agencies scoring better results on their ISO grading, with all CFAI-accredited agencies receiving ratings of either 1, 2, or 3, far above the national average. Because of the strategic emphasis of the process, the community is engaged in the strategic planning effort and is integral in helping to define the services they want, and through the process the gain a better understanding of how the department operates and the challenges the organization faces. That level of transparency with the public is a vital piece of what makes this process so invaluable. 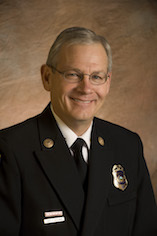 Randy Bruegman, CFO, FIFireE, is the past-president of the CPSE Board of Directors and chief of Anaheim (CA) Fire and Rescue.